The legendary 1927 New York Yankees will forever be arguably considered "the greatest team in baseball history!" Led by Babe Ruth's 60 home runs and Lou Gehrig's MVP season, "Murderer's Row" (Ruth, Gehrig, Lazzeri, Meusel and Combs) paved the way for the Yankees winning an amazing 110 games against only 44 loses, literally "cake-walking" to the American League pennant behind the wizardry of HOF manager Miller Huggins. 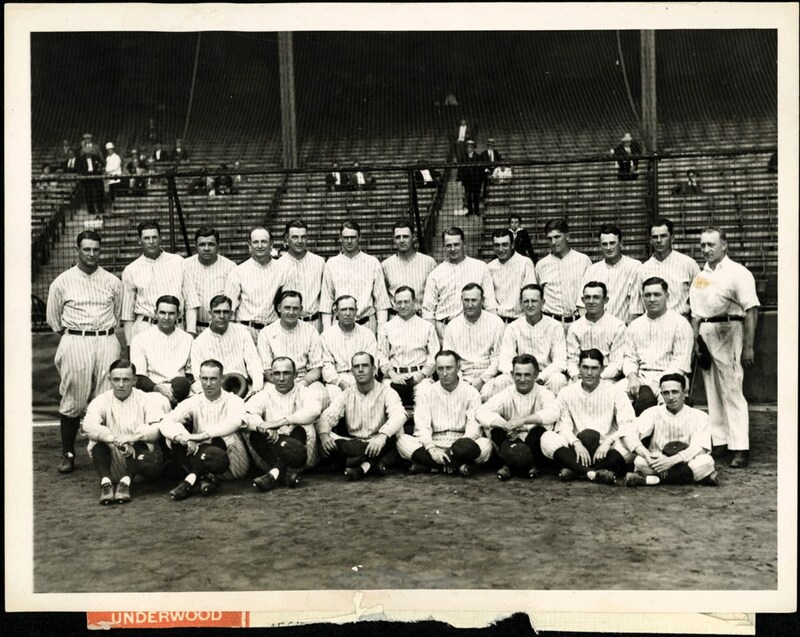 In almost "anticlimax" fashion, the Yankees would eventually claim their second world championship by easily sweeping the Pittsburgh Pirates in an uncontested four games in the Fall Classic. 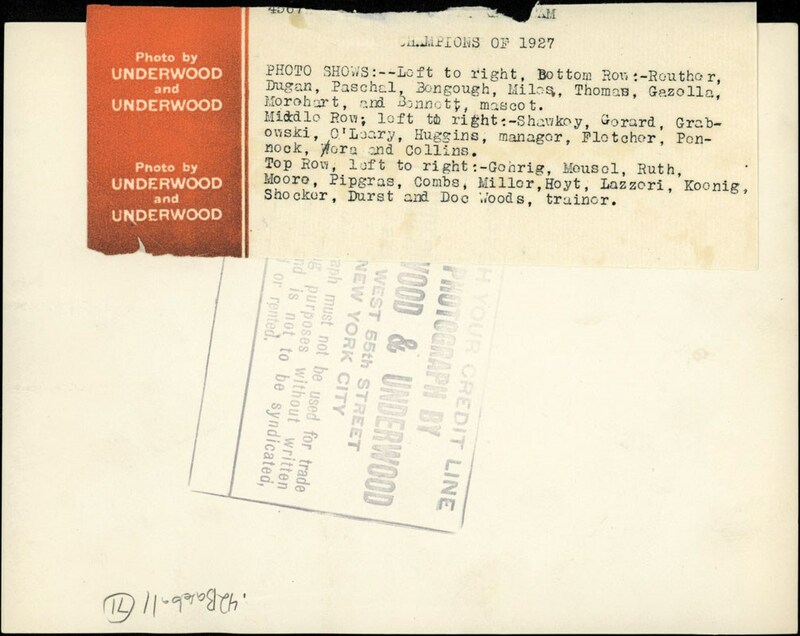 As a fitting testament for that unparalleled season, presented here just happens to be a breathtaking 6-1/2" x 8-1/2" PSA Type I photo of the 1927 New York Yankees, taken by the renowned Underwood & Underwood News Service after they claimed the World Championship. Emanating miraculous aesthetics, this 92-year old keepsake portrays world-class clarity and contrast, with no serious flaws compromising its "awe-inspiring" glossy surface. 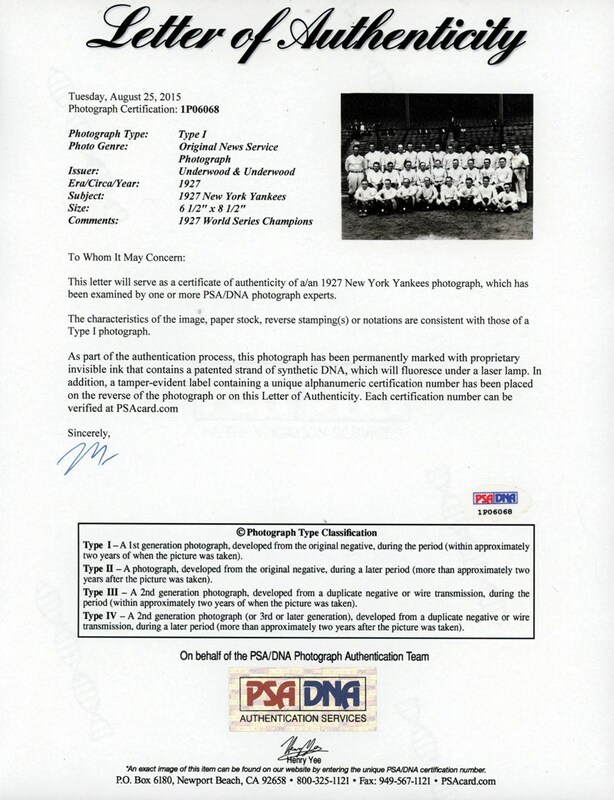 All the iconic Yankees are present including Ruth, Gehrig, Lazzeri, Combs, Meusel, Hoyt, Pennock, Shawky, Huggins and so many more of the stars that comprised this immortal team (there exact positions in the photo are clearly indicated on the verso's caption).